Cabin & Lodge Rustic Wooden Signs from Our Backyard Studio, The Hearthside Collection, Primitives by Kathy, and lots more! Add a touch of rustic decor to your cabin, lodge-inspired room, or lake house! 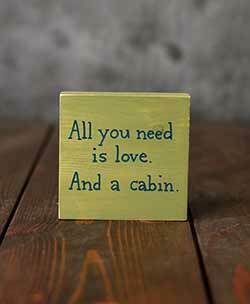 All You Need is a Cabin Shelf Sitter Sign - Hand painted to order, by Our Backyard Studio in Mill Creek, WA. All we need is love. HOWEVER - a cabin hideway makes things just a bit better! 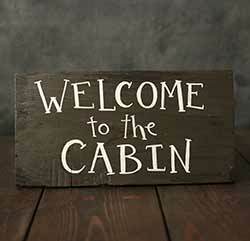 This little sign makes a great gift for someone with a cabin, or who loves the cabin lifestyle. Deer and Beer Box Sign, by Primitives by Kathy. This line of deep wood plaques is so popular, we can hardly keep them in stock! Painted and aged in brown with white lettering, they hang on the wall or sit on a shelf. 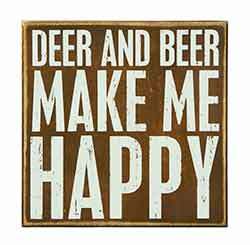 This is for the Deer and Beer Box Sign, which reads: Deer and beer make me happy. Measures 8 x 8 x 1.75 inches. Wood. Send a quirky message to guests (or family?) 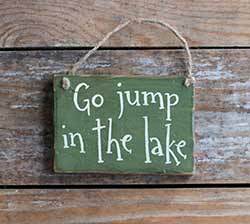 with this "go jump in the lake" hand lettered sign! Great for a small spot on a wall, on a front door, or centered inside a wreath! 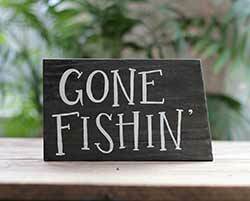 Gone Fishing Rustic Wood Sign, by Our Backyard Studio in Mill Creek, WA. Hand painted on reclaimed wood, this fishing sign makes a great wall accent for your cabin, rustic home decor, or gift for someone who loves to fish! 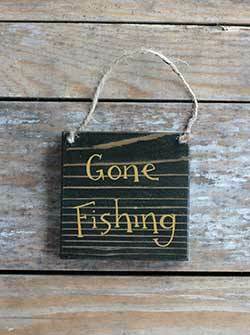 Great for any cabin or lodge themed home, this Gone Fishin' sign features freehand lettering, and reclaimed wood for a unique, rustic look! 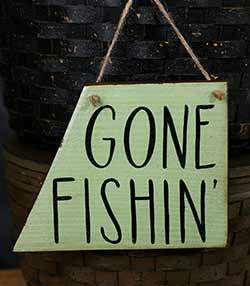 Perfect for a cabin or office, this Gone Fishing Sign features hand lettering and reclaimed wood. Available in two in two sizes. 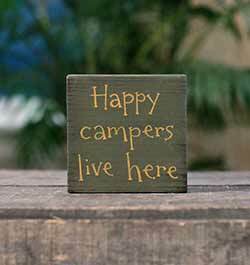 Perfect for lodge decor or a cabin getaway, this little wood sign features rustic colors, and hand lettering reading: "Happy campers live here." This made-to-order sign features free-hand lettering, in the custom color of your choice! 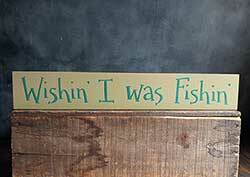 This one reads: "I'd rather be fishing." 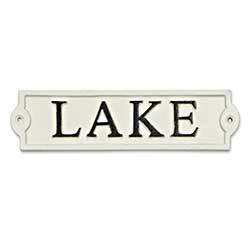 Painted with a white finish, this cast iron "Lake" sign is perfect for a cabin, or lake house! Add a rustic touch to your home with this hand lettered sign, featuring reclaimed wood and freehand lettering! Perfect for a woodland themed nursery or bedroom, lodge decor, or a cabin hideaway! 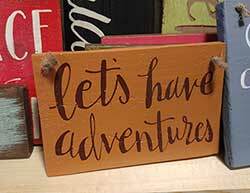 Great for a cabin getaway or wee wanderer's bedroom decor, this Let's Have Adventures wood sign features a rustic color palette and freehand lettering. Perfect for that rustic lakeside getaway, this hand painted wood sign is perfect for your home by the water, or a cabin! Give yourself permission to take it easy with this "on lake time" hand lettered rustic wooden sign! 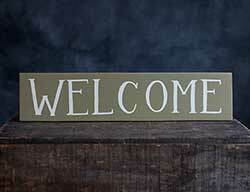 Add a one-of-a-kind rustic touch to your home or cabin with this hand lettered, distressed Welcome sign! 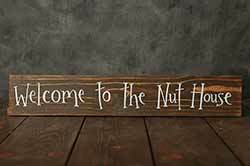 Perfect for your cabin or lodge-themed home, this rustic welcome sign is the perfect way to greet friends and family in your entryway! Green and black with cream lettering, 10-12 inches wide. 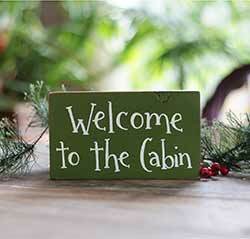 Send a welcome message to guests at your cabin with this hand lettered sign! Great for a small spot on a wall, on a front door, or centered inside a wreath! We designed this sign because it fits our quirky, crazy household perfectly. Maybe you have the same kind of nutty home as we do? This will be perfect for your front door or entryway! 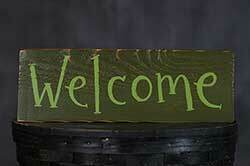 This rustic wood sign is great for any cabin or lodge themed home, reading "welcome" in a natural palette of soft moss green and cream. At home, at work, most anyway, a fisherman (or woman!) 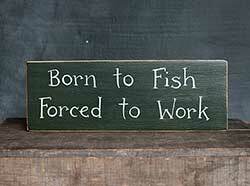 is most often dreaming of the peace and quite of a favored fishing hole, with plenty of biting! 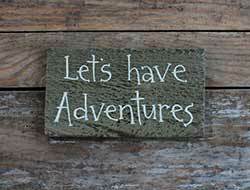 This rustic wood sign is great for any cabin or lodge themed home.